She acted polite, but it was clear to the tribe that she wanted them to leave. So they did. That was the day my life went from unpopular Xweetok juvie to Water Crimeon. As I suspected, lots of tedious training was to come. I silently performed my tasks in the temple as the other three Crimeons dictated. I tried to avoid Kalitersa. It was boring, but apparently it was supposed to be an honor. I was a juvenile, Kalitersa was mature, and Aria and Ryiru were rather elderly. You can see why I was miserable. I guess the job came with its perks. I was the only Water Tribe member who could roam freely around the other tribe's territories. Normally the borders kept people in check, and people of different tribes weren't allowed in different territories. Xweetoks, Buzzes, Lupes, and Techos were all hunters, so I can see why divided territories were important. Although I couldn't quite see why all four tribes didn't simply abolish the borders and live as one tribe. I suppose it was the differences in our customs, and maybe, races. It wasn't something I liked to think about. In any case, I was a sort of ambassador; diplomatic immunity and all. Borders were non-existent to me. I got to meet Techos from the Fire Clan, and Buzzes from the Wind Sages' society. I was respected, even though I was only a juvenile. As soon as they saw my disk, it was a no-brainer. That thing was like a crown, and I was the monarch. The Earth Warriors were a bit different. The juveniles were cute and friendly, but often hurried away by their parents. They didn't seem fond of me. In fact, they seemed to hate me. I felt that the only thing that kept me safe was my so-called diplomatic immunity. I didn't spend much time there. I had heard rumors about the Earth Warriors. They were the most war-like of the tribes. Even juveniles were trained in martial arts. It wasn't cruel; in fact, it was almost a game to them. The adults were fearsome looking. Many had battle scars. They seemed to fear Kalitersa. Their tails went between their legs wherever she reared her head. She was pretty much the only adult without scars. I imagined it must be brutal to grow up here. Training was hard, but nothing I couldn't handle. The coolest part was the disk-morphing. When I trained, I would activate it by willpower. The disk transformed and wrapped around me. It became this sort of liquid-metal armor that was divided into sections to allow for movement. It made a visored helmet around my head, and even sprouted huge butterfly wings from my back! How cool is that? On my mane were three spheres; they were for holding water. I guess it was part of the defense mechanism of the disk. Whenever I morphed, any available water flowed into the disks. It was basically an emergency power source, in case there was none available. The other Crimeons had similar ones. Kalitersa's, Aria's, and Ryiru's were on their chests. I usually kept my tail uncased as well as my ears. I willed the armor not to spread there. I mean, Xweetoks are forest-dwellers, right? A metal tail's no way to balance, and metal-covered ears are certainly no way to hear. I could fly and have magic armor, and control water! Sounds perfect, huh? Wrong. Most of the time, I trained. Alone, using training scrolls with techniques left by the previous Crimeons, I would practice techniques. There were some pretty cool moves. Ice was a powerful asset, and unlike the other Crimeons, water was abundant in three forms. I guess Kalitersa could control magma, and maybe Ryiru could too. Earth was never a gas, at least on this planet, and I imagine it would take a lot of energy to make it that way. Aria could freeze air, but it was rarely liquid, and that technique left her winded (no pun intended). Ice was my favorite plaything. I could freeze it into any shape I wanted. One day I showed Kalitersa- big mistake. I was in the training room, which, for me, had a stream running through it. I moved the water with my hands and made an ice sculpture. It was supposed to be a duck, though it looked more like an amorphous-blob duck. Kalitersa just laughed and told me to quit goofing off. She smirked, and left me alone with my blobby ice sculpture. I decided to get back to training seriously. Years passed, and I had become a fully-trained Crimeon. I would even duel with Aria and Ryiru. 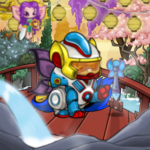 Ryiru turned my water to steam, and melted my ice, but I figured out that I could load the air with so much moisture that he couldn't light a spark. Aria was a difficult opponent. We seemed evenly matched. After a while, Ryiru didn't duel me anymore. Kalitersa always refused to duel with me for some reason. I learned a lot about Crimeon culture during my time here. One was that water and air were so-called sister elements. It means that the two elements compliment each other, make each other stronger. I guess it made sense. The ocean's currents are partially due to wind. And wind, in addition to the moon, creates waves? Wind and water also came together to create storms. Fire and earth were sister elements as well, though less in-sync, I suppose. Earth, when heated to high temperatures, becomes magma. Kalitersa and Ryiru could control it in that state. Fire was simply plasma, the highest temperature-state of matter. Stuff goes solid at the lowest temperatures, and doesn't change beyond that. Then it becomes liquid, then gas, and finally plasma. The sun had hydrogen and helium, among other things. That's normally a gas, but at those temperatures, it's plasma. A ball of fire. Any material could be made to plasma, in theory, but it required unbelievable amounts of heat. I guess Ryiru always had to deal with that. Energy. That was what it was all about. How to manage it, how to adapt it. It was complicated. I think water was actually one of the easier ones to work with. Solid, tangible, like earth, but soft and shapeable like air. Things seemed peaceful until the fateful day when I overheard a conversation between Kalitersa and a fellow Lupe. I had been in the temple, practicing a technique, when I noticed Kalitersa sneak out through the front door. She seemed suspicious, so I followed. Eventually I ended up in the Earth Warrior tribe, and she and a male Lupe were conversing in the forest brush. I leapt up onto a tree branch and listened. The Lupe called Litonu considered this for a moment. I couldn't believe my ears. What did they say?! Destroy the tribes?! We could go from place to place, forcing submission wherever we go. What choice would people have if we controlled all of nature? Kalitersa continued. “I don't think we'll be able to get recruits without spilling the secret to someone who might, well, tattle,” she scoffed. “Sounds like a plan to me.” Kalitersa smiled. “Traitor!” I whispered under my breath. Did she hear me? No, her back was still turned. I cautiously arose from my perch in the tree and leapt to the next. I had to tell Aria and Ryiru! I leapt to the ground, on open grass now, and sped towards the central temple. Oh no! She saw me, she saw me! I saw Kalitersa speeding towards me. I felt a chill run down my spine as I saw the grey disk on her back transform. Over her light lavender coat grew a darker pinkish, liquid armor. It covered her from head to toe and segmented itself. Her icy blue eyes became covered with a completely transparent eye-covering. Her hatred showed through them. Finally, two sinister-looking butterfly wingsets sprouted from her back. Litonu followed close behind. Oh man, they're gonna kill me! I did the only thing I could do; I willed my own disk to morph.